More properly called The Hospitality of Abraham, it depicts the three angels sent to Abraham to inform him and his wife Sarah that they were to have a son. Abraham, personifying hospitality, provides the best meal he is able to offer. 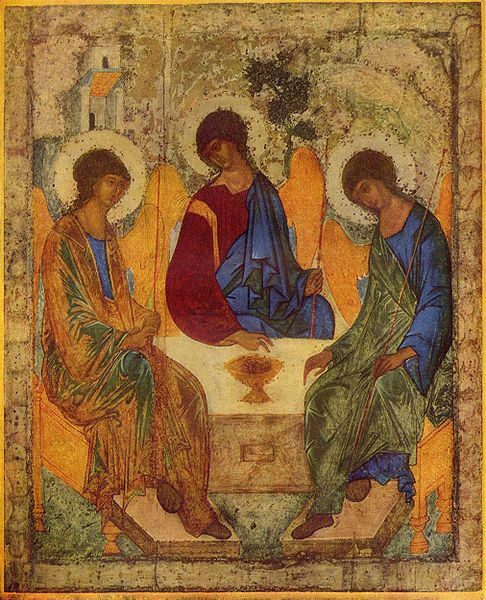 Note how the central angel is dressed in the same colors normally found on Christ and how the central angel is blessing a chalice. This, therefore, is understood to be a prefigurement of the Divine Liturgy, where Christ is the High Priest. 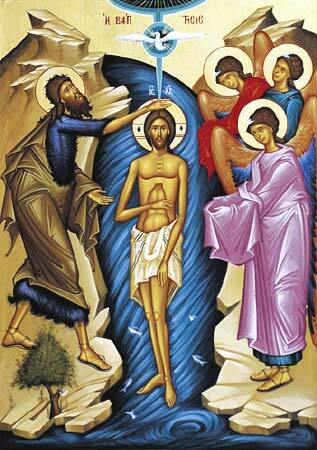 Lord, when You were baptized in the Jordan, the worship of the Trinity was made manifest. But neither was Abraham ignorant of the Holy Spirit; he saw Three and worshipped One, for there is one God, one Lord, and one Spirit. And so there is a oneness of honour, because there is a oneness of power. Thus, St. Ambrose gives witness to a similar Trinitarian interpretation of the Hospitality of Abraham that modern Orthodox Christians do. I would have to do more research, but this is the oldest such witness that I am aware of.